The first recorded exploration of the Hunter River by European peoples occurred by accident during an attempt to capture escaped convicts. On the 5th of September, 1797, a government cargo ship the ‘Cumberland’ was boarded by escaped convict pirates on the Upper Hawkesbury river. After being forced off the vessel, the crew of the ‘Cumberland’ reported the theft in Sydney. Lieutenant John Shortland pursued the ‘Cumberland’ in a whaleboat, searching Port Stephens. The area of Port Stephens had been previously encountered in 1790 by a similar group of escaped convict pirates. While Lt. Shortland did not find the convicts or the pirated ship, he did report the sighting of a river, which he named the ‘Hunter’ (known as Coquon to Aboriginal people) after the governor of NSW. The picture to the right depicts a view that Shortland might have encountered as he found the river. Shortland took note of the abundance of coal in the area, bringing back samples to Sydney. At this time, the original inhabitants of the area, Aboriginal peoples, were already using coal. Two years later, Governor Hunter arranged the first export of coal from the Hunter River, (then also nicknamed the ‘Coal River’) which was shipped to India. Regular shipping trade was established on the Hunter River by 1800, with timber and lime being exported as well as coal. 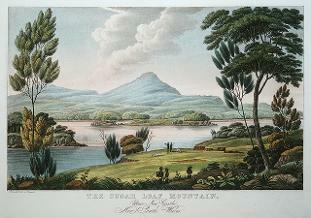 1824 Joseph Lycett (c1774/75 - 1828) The Sugarloaf Mountain, near Newcastle, New South Wales. Courtesy Newcastle Region Art Gallery. Similar to the 'Cumberland' incident, the cargo vessel the 'Norfolk' was also pirated by convicts. Fifteen convicts captured the 'Norfolk' on the Hawkesbury river, but while attempting to sail to India they were caught in a storm and ran aground in Port Hunter in an area known from then on as 'Pirate Point' (Stockton). Some of them found refuge with the Aboriginal people of that area. These convicts are thought to be the first European settlers of the region.